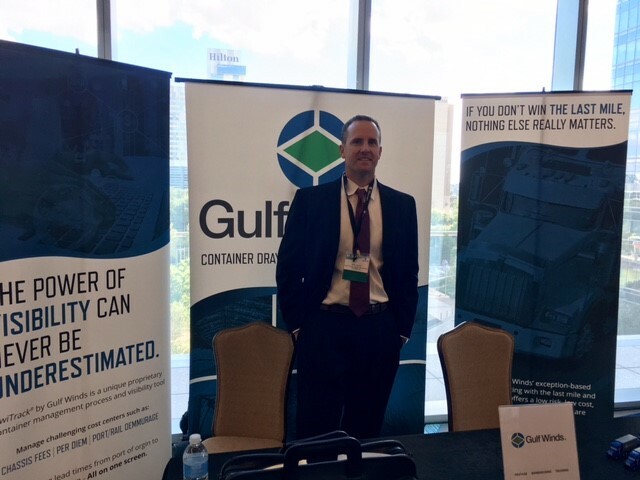 Gulf Winds recently sponsored and participated in the 2nd annual Journal of Commerce, Gulf Shipping Conference here in Houston. This is a nationally recognized conference focused on the needs and opportunities in the Gulf region. It is only natural that Gulf Winds would be a head line sponsor for the Gulf Shipping Conference, it’s in our name right!? With over 80 Shippers and over 300 attendees, Gulf Winds was able to interact with several of our current clients as well as future partners. Additionally, Gulf Winds was the only logistics company invited to participate in a closed door, Shipper-only roundtable discussion with the Port and several key players. Patrick Maher and Todd Stewart discussed Gulf Winds early adoption to technology and continual investment to ensure we have the tools and visibility the shippers need. Topics of note from the 2 day conference included the challenges associated with increased resin exports and the effects on other shippers, such as small to mid sized companies, and seasonal exporters. The Gulf region will continue to see increased growth across all commodities and the steamship lines are expected to follow suit with increased calls to Houston, New Orleans, and Mobile over the next 2 years. We live and operate in the best area for shipping in country. The next 2-3 year will be exciting times for our region!